FILM SOCIETY OF THE YEAR AWARDS – SHORTLIST ANNOUNCED! We are delighted to announce the 2018 Film Society of the Year Awards shortlist! We would like to congratulate everyone who made it – we can’t wait to see you at the award ceremony on 8 September in Sheffield. If you didn’t make the shortlist this time, please don’t be discouraged. The standard of applications was extremely high this year, and the judges had a very difficult job. 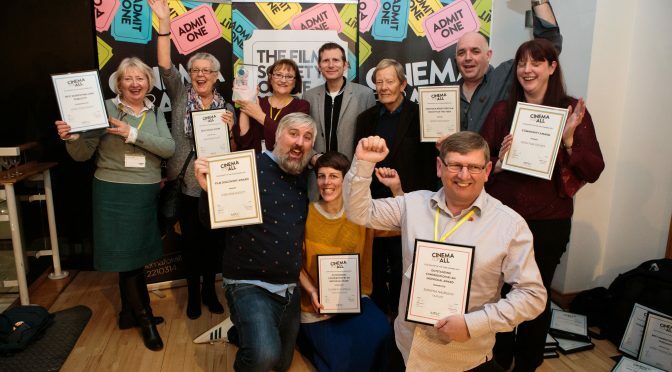 The awards will take place as part of the Community Cinema Conference weekend, from 7-9 September 2018. This year’s conference is full of talks, panel sessions and masterclasses to support community cinemas in areas such as representation, community outreach and diverse film programming, as well as covering some of the core topics like sustainability and marketing. It’s also a great chance to watch some incredible films to get ideas for future screenings, and chat to other exhibitors from around the country! The Film Society of the Year Awards and after party will take place on the Saturday night, 8 September, and will be co-hosted by Sheffield Lord Mayor, Magid Magid. It’s a fantastic event, and there will be complimentary drinks, pizza and lots of dancing to celebrate your commitment to community cinema! If you can’t attend the full weekend, you can get tickets to the Film Society of the Year Awards for just £5.